We pass by all sorts of crazy warning signs every single day—including police tape, wet floor signs, and crazy road warnings. But do they actually connect? Editor's note: Hey guys, ran into a snag with a story I was hoping to run tonight, so going with a rerun of a classic issue instead. Hope you dig! 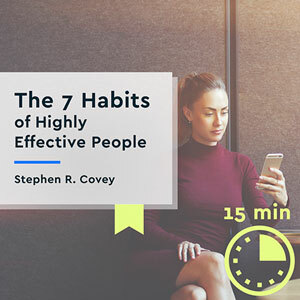 Read or listen to the key ideas from "7 Habits of Highly Effective People" and 2000+ nonfiction books in 15 minutes with the Blinkist app! Download the app for free now. Available on iOS and Android. "Even if a warning is perceived and comprehended, it will not be effective unless it induces people to behave safely." — A line from Warnings: Fundamentals, Design, and Evaluation Methodologies, a technical book on the nature of warnings, first published in 1986, which is believed to be the first in-depth analysis of the importance of warnings ever published. (Good luck getting your hands on it. Amazon sells it for more than $600, though one of their other books about warnings goes for a lot less.) The authors of the book, James M. Miller and Mark Lehto, have closely worked on this issue for decades, from the perspective of human and philosophical factors, rather than merely from an appearance standpoint. Beyond running JM Miller Engineering together, the partners have written four books on the topic of warning signs. When you're done reading Fifty Shades of Grey, this is the next book you should pick up. Once relegated to crime scenes, barricade tape or police caution tape, the yellow-and-black plastic that tells people not to cross, has become something of a pop-culture icon, quietly showing up on the bedrooms of rebellious teenagers and on guitar straps for decades. Strangely, though, finding out where it came from is really freaking hard. It's one of those things that has taken over the world, but nobody bothered to explain how or why it did. Doing a Google search on the history of barricade tape may make you feel completely lost, which is how I felt when I first started searching. Even with a lot of deep digging, I could only find a single reputable source that had covered the rise of barricade tape as a cultural phenomenon: The Miami Herald, which wrote about it in 1998. In his piece on the subject (which, as a favor to you guys, I've replicated here), Geoffrey Tomb describes the way that tape has become a mainstay at rock concerts and road repairs. It even, according to Tomb, has become more popular than Bob's Barricades, a mainstay of Florida warning signage that works closely with the state's department of transportation on traffic control issues. The crime-heavy city of Miami went through a lot of the yellow stuff, so much that they had started to use bilingual tape. What inspired Tomb to write about this topic? To put it simply, there was a crime scene that was so large that it required the use of a lot of police tape. "So much yellow tape was used at a police shooting in Miami last week that all four corners of an intersection of two city streets were roped off by multiple lines, making it look like a boxing ring," Tomb wrote in his story. "Yellow tape blocked traffic on streets nine blocks away from the shooting scene." Going back to my original question, the reason I started down this rabbit hole in the first place, when was police tape actually invented? Tomb dates the invention to 1962 and credits the invention to a California company called Harris Industries, which produces a variety of plastic warning tapes for purposes far beyond crime scenes, following the color codes recommended by OSHA standards. Despite the fact that the tape tends to be used for official reasons (think signifying a chemical spill or a construction risk), the very inexpensive nature of plastic warning tape is the exact thing that makes it perfect for trolling. You can buy a giant thing of police tape on Amazon for less than $10, and you can even work with vendors to create your own customized warning tape. 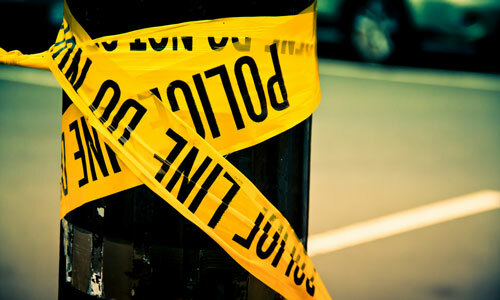 Generally, this gets used for things like halloween decorations, but in 2009, teachers at a primary school in the United Kingdom were criticized for using the tape as part of a mock crime scene on the school's campus. Apparently, trying to go all CSI on six-year-old kids is frowned upon in some parts of the world. The year that European countries met in Vienna to discuss standardizations for warning signs on roads with the support of the United Nations. The resulting treaty quite literally set the rules of the road around the world for warning signs of all types. While not a party to the treaty, the United States was directly inspired by the results as the country moved to symbol-driven warnings in the early 1970s. Rubbermaid sells a lot of wet floor signs, but few rise up to the wood-and-metallic level of the company's Executive Multi-Lingual Wooden Caution Sign, which looks like it should be a trophy rather than a wet floor sign. "This wooden caution sign is designed to work with a wide variety of Rubbermaid products, helping to make cleaning and waste management more efficient and safe," the company says on its website. 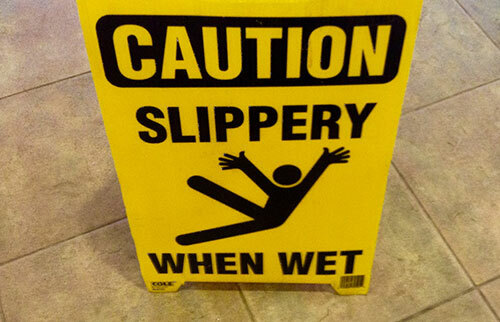 Not to be outdone, a company called Banana Products has made an impact in the world of wet-floor signs by creating variations that look like … wait for it … bananas. Fortunately for Rubbermaid, it has other tricks up its sleeve. One of those tricks is a product it calls the Over-the-Spill Station, which is akin to a Post-it note for spills. instead of putting down a sign, you put down super-absorbent paper towels that warn the public while picking up the stain. Perhaps the ultimate example of floor-warning innovation, however, goes to the Hurricone, a device that combines a wet-floor warning cone with a floor-drying device, a joining of technology and helpfulness that any fan of hand dryers is bound to love. Does this patent application represent the future of wet-floor sign technology? The invention, submitted by a guy named Rick Charles Furtado, includes a timer, a speaker, and motion sensors. Any more knobs on this thing and you might as well make it Android-compatible. "The thing is though, that the people who really need to see this sign, are most likely just gonna pass it with their eyes glued to their screens." — Jacob Semple, a Swedish artist, discussing the project he worked on last year with his creative partner, Emil Tiismann. The duo threw up a bunch of signs around Stockholm warning drivers of people caught up in their smartphones, texting and doing a bunch of stuff that people do on their phones. Semple said the project was inspired by personal experience. "One morning when I walked to work I almost got run over by a car because I was staring at my stupid smartphone," Sempler told Tech Insider in 2015. "I looked around, and realized that I wasn't the only one." The point that Jacob Semple tripped onto in making his smartphone art project is pretty similar to the one that Mark Lehto has been making in numerous ways over the years. Lehto, the guy who co-wrote the technical book on warnings that we mentioned earlier in the piece, is a longtime faculty member at Purdue University with a deep interest in "Human Factors"—in other words, the way that humans interact with information given to them. As it turns out, humans don't necessarily handle this information very well. In 1995, Lehto organized a study in which a number of subjects were asked to complete a task using a foul-smelling glue. Despite the fact that the label clearly recommended that people ventilate the room before using the glue, only one of the 54 subjects did just that. "This study suggests that if someone's main goal is to complete a task, the benefits he perceives in finishing may outweigh the risks of skipping a safety step," Lehto said of the study in 1997. "Similarly, if someone's out to have a good time, the benefits he sees in having fun may outweigh the risks he sees in driving drunk. If you want people to behave more safely, you need something more dramatic than a warning label." Warnings already focus on bright colors and and dire wording—just look at cigarette warnings. How can we make them better?